You won't have any left overs with this pasta! Last night my good friend stopped by and talked with me as I cooked the evening meal. He curiously inspected the cupboards and every inch of the refrigerator looking for signs of heretical ingredients and hidden hypocrisy lurking on packaging information that we may have missed during our Lenten exorcism of all things non-vegan. Almost ready to give up, he suddenly rang out with “Xanthum Gum!” an ingredient he had found on the label of our Trader Joe’s almond milk. “That can’t be any good for fighting cancer!” he triumphantly declared. “I thought it was from Xanadu,” I blithely replied, a little annoyed at his petite inquisition on our kitchen. It’s interesting how when you start a new regimen or try to create a new good habit or quit an old bad one that others are threatened by your attempt to change your ways. “You know, you aren’t supposed to have any oil on the Chinese Diet. Everyone that I know that’s on it says you can’t have any oil,” he pointed out for the third or fourth time since we started just a week ago. I found it strange that he was so concerned about the orthodoxy of our approach, but I think I understand. My initial motivation for a change came from watching the documentary “Forks Over Knives” and its hopeful message that cancer, diabetes, heart disease, and other modern plagues could be cured or controlled with diet and The China Diet Study was a big part of the movie. If the documentary is correct, then it is an enormous indictment on way we eat. My good friend lives an envious life where his job allows him to eat at the very best restaurants in Los Angeles multiple nights each week and seeing mounds of vegetables going into a plant-based, whole-grain meal was a stark reminder that his lifestyle was perhaps not a good fit for a family history rife with heart disease. I figured that finding a flaw with our approach would let him off the hook of facing the need to change his own ways. 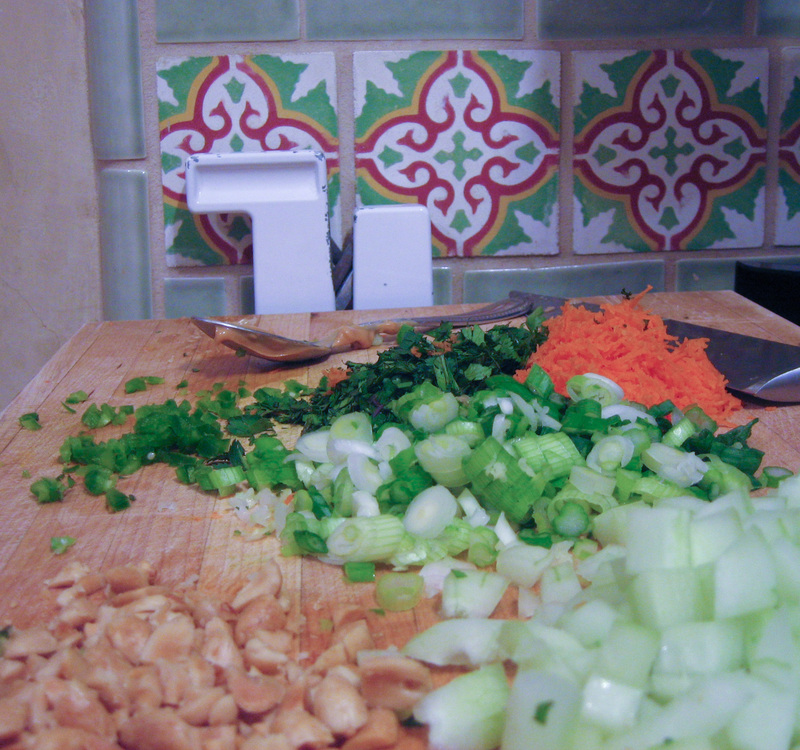 Our talk turned to other topics and as I continued to chop, little colorful mounds of diced vegetables grew into a spectacular mise en place (the French term for having everything cut and prepared before you start cooking). My friend examined the chopping block and suddenly stopped. It made me miss his mom too. She had inspired me in so many ways when she was alive, but nowhere as much as experiencing her joy of being in the kitchen and cooking for her family and friends. That’s when I realized why it’s so hard for us to give up our strong beliefs and feelings about what we eat. Our feelings about food are largely about experience and memory. Just the smell of fried chicken will instantly put me back in my grandmother’s kitchen, sitting at her Formica table and my grandpa’s ball game droning on in the background. That’s a memory that I never want to lose. It’s also a feeling I want to recreate for my own son and somehow think of him passing it on to his children. It’s no wonder that faced with the sobering possibility of premature death, my brother and almost everyone else in the world, still finds it hard or impossible to make a change in regards to diet. That’s why I, with an ever increasing waistline, could still slather my crusty Tuscan bread with duck fat before I grilled it and called it breakfast! Food is more than life. It’s our lives. What else is there in the human experience, except for breathing and sleeping, that we are compelled to do almost continuously from the day we are born until the day we die? It is also what we do in communion with others. There is a tacit agreement when we sit at table and break bread or cut meat that our lives, our histories, our memories are somehow connected to each other. We understand each other when we sit at the table together. When we change that paradigm, we upset the balance between friends, families, and lovers. More than fear that my diet should somehow influence him, my friend searched my cupboards trying to make sure I hadn’t thrown out over thirty years of shared experiences and memories with the chicken stock. It’s the same reason many vegetarians and vegans go to great lengths to find dishes that feel meaty, fake cheeses that taste and melt cheesy, and non-dairy milk that tastes as good in a bowl of cereal as it works in a favorite baked good. It’s why I drove all over town looking for Seitan, a great wheat based meat substitute. I wanted our meals to taste and feel like the ones at my mother’s table or like the first meals that I ever cooked for Andrew. Who knows, maybe Xanthum Gum really does come from Xanadu. It surely has helped Andrew and me make a drastic transition into the future without having to let go of a past that holds our dearest and most cherished memories of how we became father and son. This has a long list of ingredients, but it comes together very quickly on a school night when time is important. If you live near a Trader Joe’s, all the ingredients will be very easy to find. 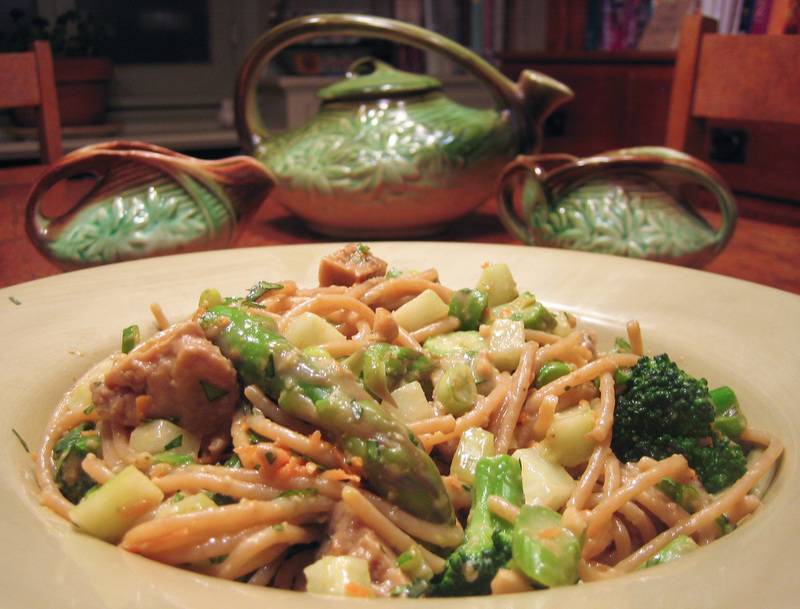 There are many versions of this type of Asian-influenced peanut butter pasta, but I wanted something with a lot of flavor and enough vegetables to feel like I had served a nutritional meal. The combo of quickly cooked broccoli and asparagus tips works nicely with the fresh crunch of the raw veggies. Andrew ate about half-a-pound of the dish and took leftovers to school for lunch for the first time. It’s what he calls a winner. I think you will like it too. Vegetables: (These can vary by season or what’s in the fridge, but broccoli and asparagus are a really good match. Note: If using Asparagus, cut the tips off and then cut the stalks on a diagonal slant. Use only the tender upper parts if the stalks are thick. In a food processor or blender, add the garlic, jalapeno, ginger and process until finely chopped. Add the rest of the sauce ingredients and blend until smooth. Check for seasoning and add more jalapeno or chiles if you like a spicier sauce. Pour the mixture into a saucepan, add the Seitan, and heat over medium until the sauce is smooth and creamy and the Seitan is heated through. Meanwhile bring a large salted pot of water to boil. When boiling, add the broccoli and asparagus tips and cook for 1 to 2 minutes. Remove them from the water and place in a bowl of cold water to stop the cooking process. Return the pot to a boil and cook the pasta according to the directions. Drain the pasta when done, but keep about a cup of the pasta water. Toss the pasta with all the sauce and all the ingredients and add some pasta water if it seems too thick. Beautifully put, Don, and with a scrumptious recipe bonus! On the menu this week! Hi Uncle Don!!! That pasta looks soooooo good! It would be really hard to go vegan for Lent. My mom told me about the pumpkin pancakes. Do you ming posting that as recipe? I really want to try those! Pancake recipe coming soon and will be ready for next Saturday’s breakfast! Ok, Don instead of asking for a recipe can you just come cook this for me? Previous post: It’s Not Easy Being Green! Next post: Pancakes, Hold The Dairy.